“How many Super Bowls does a guy have to win to get some respect around here?” – SI’s Kerry J. Byrne, from his column below. Ben Roethlisberger’s name never comes up when it comes time to name the elite quarterbacks. The truth is Big Ben is one of the most prolific passers in the history of football. The problem is many fans and pigskin pundits are obsessed with meaningless volume numbers and not the meaningful efficiency numbers — such as average per attempt — that have a high correlation to success. Roethlisberger’s career average of 8.04 yards per attempt is the fifth highest mark in the history of football. Three of the guys ahead of him are in the Hall of Fame (Graham, Luckman, Van Brocklin). He’s topped 8.0 YPA in a season four times in seven years. Peyton Manning’s done it twice in 13 seasons. Tom Brady? Just once. The Steelers instantly became contenders the day Big Ben walked on the field. And they are a threat to win it all again. Roethlisberger’s historic ability to puncture defenses with long passing plays is the biggest reason. You can read more from Mr. Byrne here. His formula – these quarterbacks complete better than 60 percent of their passes, have 4,000-yard passing potential and demonstrate fourth-quarter comeback ability. These players can carry a team to the playoffs. 4. 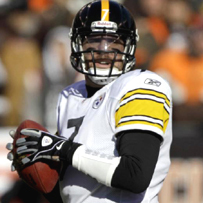 Ben Roethlisberger – Roethlisberger grew up as a person after starting the season with a four-game suspension and remained every bit as good as a quarterback. The only knock is his tendency to have low-scoring games against top defenses. Mr. Clayton also has Ben ranked as the top tier quarterback in the AFC North. To understand his ranking system and to read his full list, click here. I briefly mentioned earlier that my definition of an elite quarterback is a little different, and big-game success plays a huge role in my evaluation. Right now, I see only four elite passers in the NFL (Tom Brady, Peyton Manning, Drew Brees and Ben Roethlisberger). Flacco, Aaron Rodgers, Matt Ryan and Philip Rivers are knocking on the door — Ryan and Rodgers are pounding on it — and one of the first three may break it down during this year’s playoffs. They have to win to get my members-only jacket, though, so we’ll see. 2. Ben Roethlisberger – Roethlisberger and Manning are basically carbon copies in terms of stats. Roethlisberger has an 87.2 rating in the playoffs. Manning is at 87.6. Roethlisberger has thrown 12 TD passes and seven interceptions in his past eight postseason games while Manning is 12-6 during his past seven. One big difference: there’s that matter of one title more for Roethlisberger. Additionally, Roethlisberger can take a hit, extend plays with his combination of toughness and mobility and get the ball down field. He’s also a better player in the elements. When the weather is bad and the wind starts howling, Roethlisberger is pretty much the same guy. Manning is not. You can see his complete list here. Check out this video from the Pittsburgh Post-Gazette of Ben, Troy Polamalu and Brett Keisel talking about the team’s playoff philosophy…oh, and don’t miss Ben’s safety advice to the media concerning the dangers of Brett’s beard! “The Patriots have smart players and they have Tom Brady, and anytime you have Brady, it’s a lot easier to win. But Pittsburgh has the same thing. They have Ben [Roethlisberger], and he’s such a playmaker. And their defense, there’s not much more you can say about them except they’re always good.” — Cleveland Browns fullback Lawrence Vickers, ESPN.